It is Christmas in Palestine and doting father Abu has a duty to do. His daughter is getting married and it is his duty, the Wajib of the title, to hand deliver the wedding invitations to all the guests. 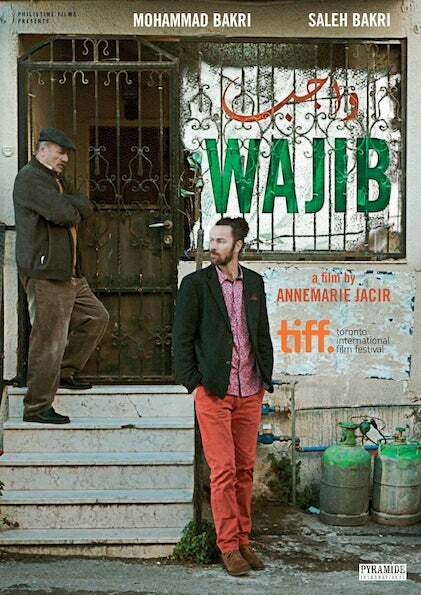 His son has returned from Italy, where he lives, to attend his sister’s wedding and help with the Wajib. As they drive around the City in their battered old Volvo, they bicker, reminisce, needle and cajole each other, gradually peeling back the layers of their relationship. In between, they meet relatives and family friends and endeavour to avoid being derailed by constant invitations to take tea. This is a wonderfully poignant, droll and witty film that interleaves tensions with hilarity.